Good managers are leaders. Great leaders are innovators. When people are empowered to be innovative, their commitment increases; they have a chance to take new actions and be proud of their accomplishments. "A Taste in the Clouds" could have been the name of a wine-tasting experience I took part in a weekend ago with Jean-Noel Fourmeaux du Sartel, the owner of Chateau Potelle in Napa Valley. The event, actually called Lunch Above the Clouds-Five Course Gourmet Lunch, was prepared by chef Ken Frank of La Toque (recently awarded the coveted Michelin star) and perfect with the multiple wines we tasted. As a professional I wonder why don't we have more such events at the beautiful existing wineries with vineyards. Shatterproof, elegant, reusable plastic wine decanter. Made from a food-safe, BPA-free polymer that is virtually shatterproof. Or challenge the status quo? Focus on systems and structure? Or have a long-range perspective? Or ask what and why? Have your eye on the bottom line? Or have your eye on the horizon? Or do the right thing? Managers do the former. Innovators embrace the latter. There are times when you need to focus on systems and structure, the short-range view, or the bottom line. However, you want the scales to tip toward real leadership-and that's not easy. This might require a new way of looking at staffing or reorganizing your team's organizational structure. You can mean implementing a radical new idea for a guest experience. Challenge yourself to be a true leader. By being a leader you can make profound changes and not only be inspired but also inspire those around you. In the photo you can see that the "gazebo" is made out of rough timber found on the 47-acre property. The lunch did not need to be reheated; the cheeses were perfect, and the desert enhanced the final wine. What a memorable experience! To view a seasonal menu and get more details, visit here. On a Thursday I stopped by a tasting room I had not visited before in the Sonoma Valley town of Kenwood. I was meeting a friend of a friend who wanted to apply his boring financial career to the exciting wine business. 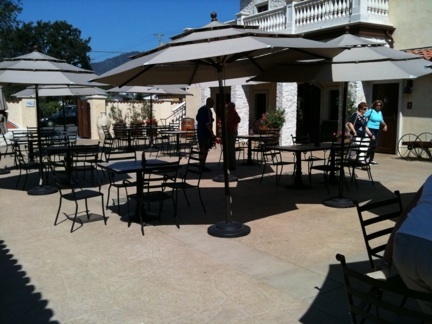 VJB is a miniature Italian village plaza with tasting room, chocolate shop, Italian deli and pizza oven in the outer kitchen. The gorgeous and inviting architecture, friendly and jovial staff, outstanding panini and wine available by the glass or bottle made me think of a warm afternoon in Tuscany...without the expense. Lots of money was spent on this property, but it is an example of the (not so) typical wine tasting room expansion that makes the winery a destination vs. a stop. Tasting Room Managers Salary Surveys are at winebusiness.com. 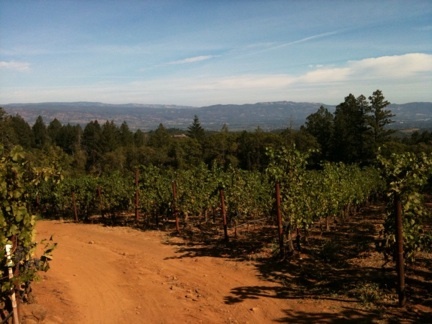 Two weeks ago on a Wednesday a friend of mine called and we toured the northern part of Sonoma's Alexander Valley. For kicks we stopped at one of the wineries I wrote about last year, and I was appalled at the poor hospitality received. Two older gentlemen ignored my friend and me, and two younger tasting room employees did marginally better but were so cold that I followed a group of four tourists (a patent attorney, two doctors and a marketing executive from Chicago) as they were leaving. I introduced myself and asked them about their experience. The responses can be summarized as: "They did pour all the wines that were on the counter, but half-way through our tasting the lady took off and never came back. A young, unsmiling gentleman took over without a word and poured the rest as cold as a prison door. 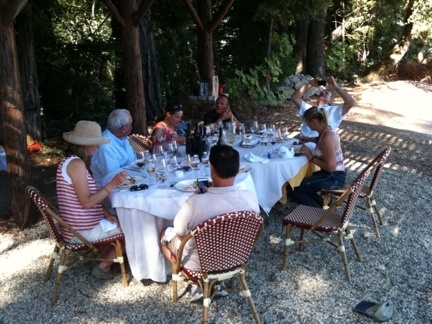 What other wineries should we go to to find a warm ambiance?" My grandfather had a great expression, "Same circus, different clowns." And that's when it hit me: These employees are not totally responsible; it must be a "corporate attitude" taught from the top. Jacques Brix is vice-president and director of sales, west coast for Wines & Vines. This column is based on his personal experiences at winery tasting rooms.